Do some cultural sightseeing at St. Patrick's Cathedral and Immigration Museum. 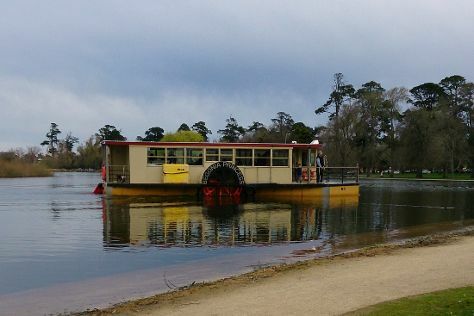 Explore hidden gems such as Lake Wendouree and St Paul's Cathedral. You'll find plenty of places to visit near Melbourne: Werribee Open Range Zoo (in Werribee), Eastern Beach Reserve (in Geelong) and St Augustine's Church (in Creswick). Next up on the itinerary: wander the streets of Degraves Street, browse the different shops at Melbourne Central, take in the exciting artwork at Australian Print Workshop, and admire the natural beauty at Fitzroy Gardens. For other places to visit, photos, more things to do, and more tourist information, you can read our Melbourne trip planner . Singapore, Singapore to Melbourne is an approximately 10.5-hour flight. You can also do a combination of flight and shuttle. The time zone difference when traveling from Singapore to Melbourne is 2 hours. Prepare for cooler weather when traveling from Singapore in April: high temperatures in Melbourne hover around 23°C and lows are around 11°C. Cap off your sightseeing on the 24th (Wed) early enough to travel to Sydney. Nan Tien Temple and Bradman Museum & International Cricket Hall of Fame are good opportunities to explore the local culture. You'll discover tucked-away gems like Wentworth Falls and Historical Aircraft Restoration Society. Get out of town with these interesting Sydney side-trips: Wollongong Art Gallery (in Wollongong), Shelly Beach (in Manly) and Tertini Wines (in Mittagong). There's much more to do: see the sky in a new way at Sydney Observatory, look for all kinds of wild species at Wildlife Areas, do a tasting at Megalong Creek Estate, and pause for some photo ops at Mrs Macquarie's Chair. For ratings, maps, other places to visit, and other tourist information, use the Sydney online day trip planner . Fly from Melbourne to Sydney in 3.5 hours. Alternatively, you can do a combination of shuttle and flight; or drive. Traveling from Melbourne in April, Sydney is a bit warmer at night with lows of 17°C. Wrap up your sightseeing by early afternoon on the 30th (Tue) to allow enough time to travel back home.